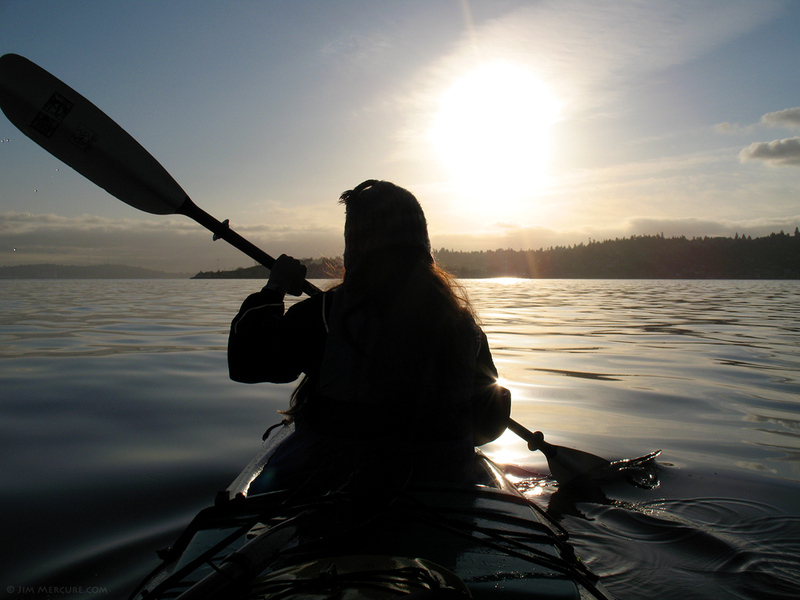 One of our favorite things to do on a nice warm sunny summer day in Seattle, WA is to go kayak camping. 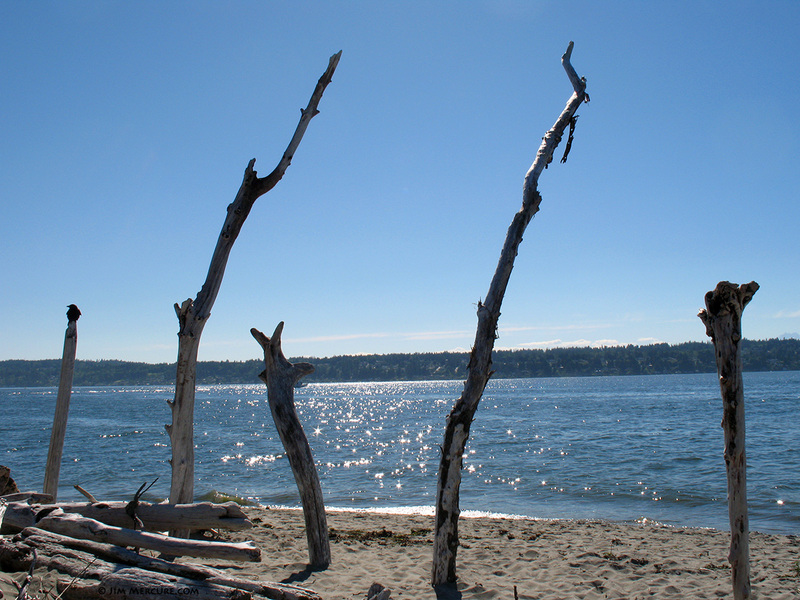 Since we live just a block off of Alki beach in West Seattle we decided to hike our kayak and gear down to the beach and paddle over to Blake Island. Living so close I got to test out my $2.00 g-sale golf caddy that I strapped to the stern of my 21′ two person Seaward Southwind kayak and walked it right down the alley and onto the beach. No car or gas involved and I got a lot of “right ons” on the way. Well it’s been one hell of a cold, rainy Spring here in Seattle and this was our first day above 75, so we were excited to get back onto the water on such a nice day. The water was mirror smooth and not a cloud in the sky, so we were really ready to soak up some sun on the “easy” 3.1 mile crossing over to Blake Island. Well, “easy” is the relative term here and there will be more on that towards the end of this entry. All around us were glorious views of the snow covered Olympic and Cascade mountains along with Mt. 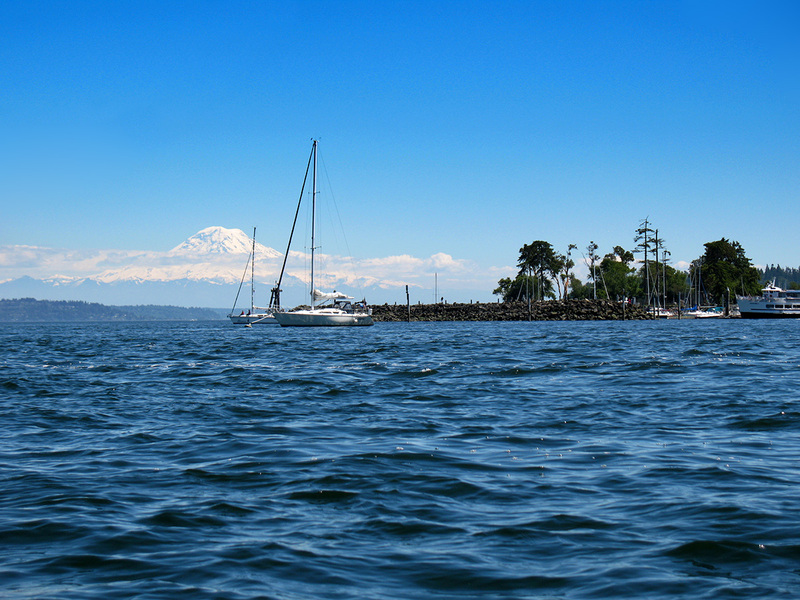 Rainier to the South and Mt Baker to the North in full spectacular view. We arrive safely and got a really nice camping spot on the West side of the island, so we quickly setup camp and set out on a little hike around the island. 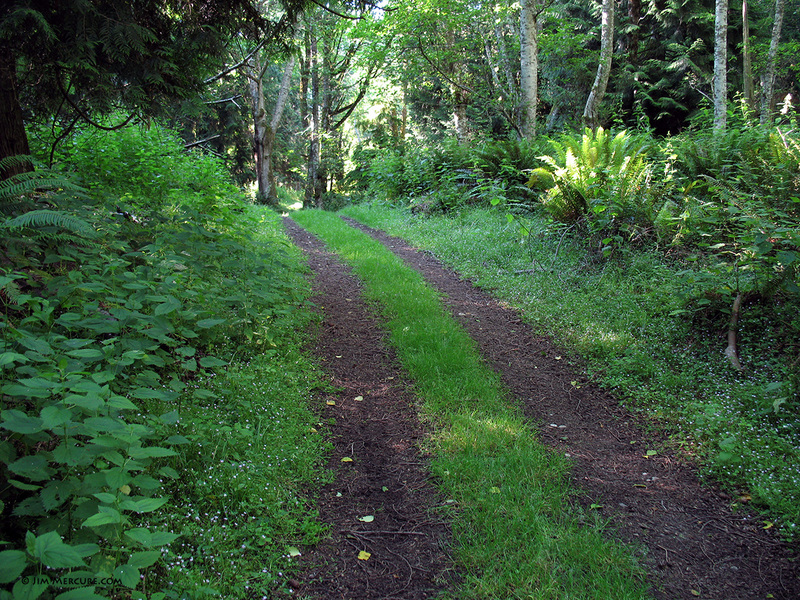 There are trails that crisscross the island, so it was fun discovering some new ones we’ve never hiked before. The birds were singing, a warm breeze was blowing and tiny blue, pink and yellow flowers littered our path. It was the first time this summer that I’ve worn a t-shirt, shorts and sandals, so I was in a pretty good mood. We finish our stroll around the island and set out to the sandy beach for some sun and maybe a dip if we get hot enough, or maybe just sit there sipping a beer or two while enjoying the view. Well, the day passed quickly and we settle down to enjoy a nice dinner and some drinks by the fire. As per our usual mode we like to stretch out our weekends by making the most of our Sunday by sleeping in, enjoying a couple cups of coffee, reading a book or newspaper and having a nice leisurely breakfast. Nothing too new here, except that we’re on the lee side of the island and didn’t notice the wind that was really starting to pick up. 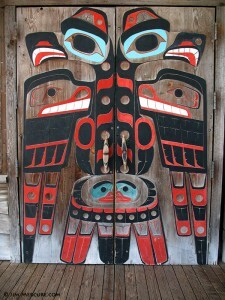 We do another hike around the island, but this time stop in at the visitor’s center to admire all of the Pacific Northwest Native America carvings and art work they have on display as well as get a good nose full of the salmon they have roasting on an open alder wood fire. Well, the hike was fun, but now I notice that the wind is a sustained 30 mph coming from the North and the water is nothing but white caps. Jen and I paddling back from Blake Island at 5:00am. 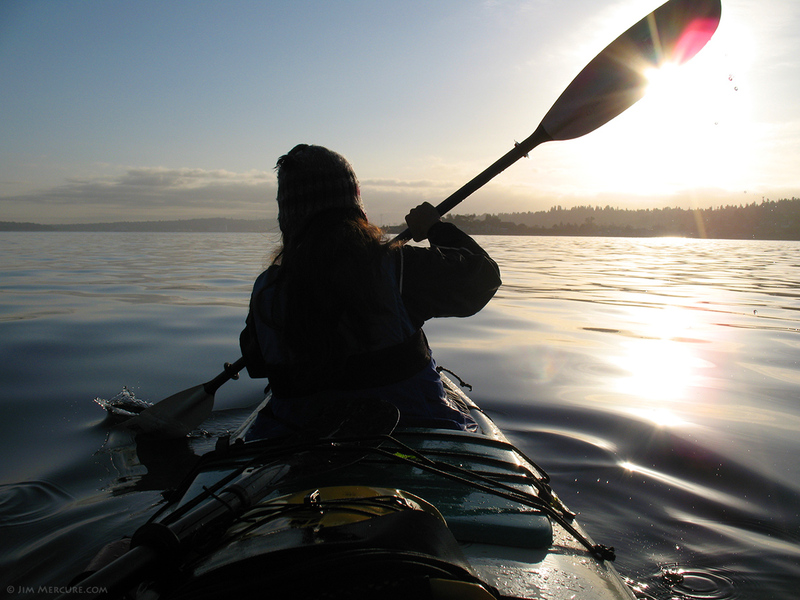 We had met some other kayakers, but they have either left earlier that morning or are going with the wind and the waves towards Manchester or Southworth. We on the other hand needed to go back to West Seattle, so not only would we be sideways to the waves, but also going into the wind. It’s just not possible. Well, we could probably do it, but it would be a terrifying paddle and life threatening if we got dumped out there in 49 degree water with night setting in. I had hoped it would calm down a bit before we made our attempt to cross, but it’s now 8:00 pm and it hasn’t calmed down at all; it’s not looking good. At this time Jen starts to freak out about missing work at her new job. I promise her that we can wait it out by staying another night, set the alarm for 4:30 am, and she’ll still make it work on time, but this doesn’t calm her down in the least bit. Oh well, I know missing a day of work isn’t worth dieing for. Jen and I paddling back from Blake Island at 5:30am. We try to enjoy the last few hours of light, but it’s a strange and helpless feeling being at the mercy of mother nature. I run through all of the plan B’s that I can come up with in case the weather still isn’t cooperating in the morning, but nothing seems to come together or make sense. Even the sudden emptiness of the campground is bumming me out. Well, there is nothing I can do about it now, so we finish the last of our beer and head to bed, but there is no relief there either. Whenever I get really stressed out I seem to run an infinite loop of problems through my head, but they’re Catch 22 problems that I never can resolve, so I can never really get a good night sleep. Well, I know I’ve made the right decision because having a restless night in a warm sleeping bag on dry land is so much better than being stranded out in the middle of Puget Sound, cold, wet and clinging for dear life to our tipped over kayak. Well that’s what I had pictured in my mind at the time. The next morning is calm, clear and partly sunny as I predicted. We quickly load our gear and have a glorious paddle back home on mirror smooth water and I can see several people waving to us, with a “that looks fun” look on their faces. We pull up onto Alki beach and unpack quickly and Jen makes it to work on time. Aahh, what a feeling. It’s like we’ve already had a good day’s adventure and it’s not even 7:00 am yet. Life is good! 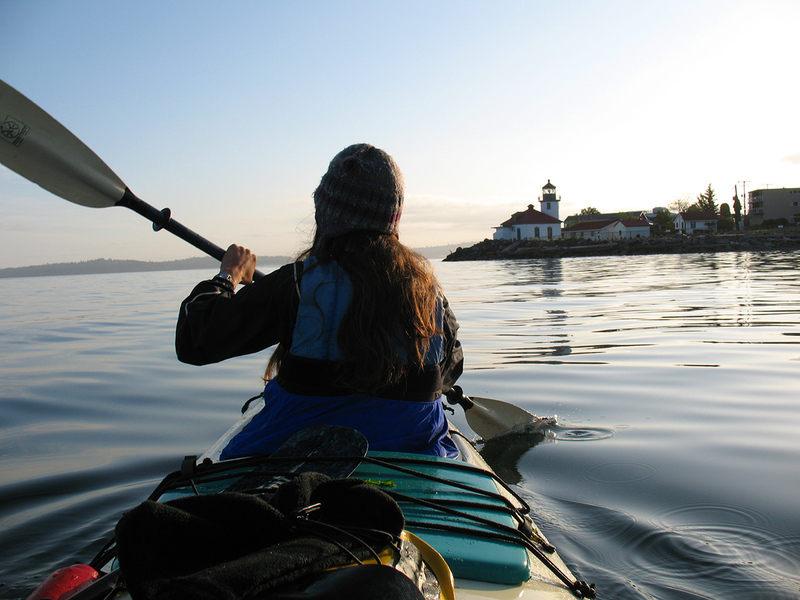 Jen and I paddling back from Blake Island @ 6:00 am Monday morning. 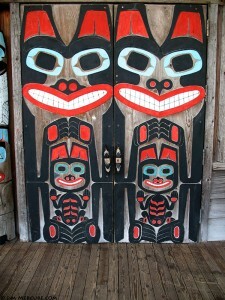 Tags: "Blake Island, Jim Mercure, WA"
That trip looks awesome…are the campgrounds on Blake Island state/public? Camp anywhere? Were you guys worried without drysuits? Thanks! Yes, there is lots of good camping. The campground near the village has great views of Mt. Rainier and the North West campground has a great sand beach. Yes, I wasn’t about to make that crossing without one, so that’s why we ended up staying an extra night and leaving at 5:00am the next morning. I have to say “what an adventure”. I girlfriend and I are looking to make a run there this week and wanted to know a little bit about availability. I’ve been on some websites and its first come first serve, (seems typical of Washington). My question is, if we leave on a Thursday morning, what are the chances of getting a spot? the second concern is, we have the Advanced Elements Advanced Frame Expedition Inflatable Kayak and was wondering if they were capable to make the 3.1 mile trip?